A Hypothyroid Mom reader named Jenny contacted me with her story of postpartum thyroiditis and it felt so familiar. 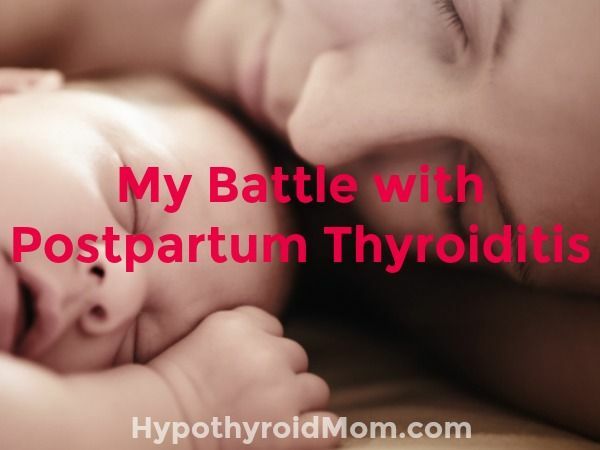 I have lived through postpartum thyroiditis after the birth of both my sons. At a time when a mother is expected to be filled with joy at the miracle of her babies, women with postpartum thyroiditis struggle feeling alone, often misdiagnosed with postnatal depression or anxiety, all while their thyroid is left unaddressed but wreaking havoc on the mother’s mind and body. But no one really wants to hear that. We are hushed and dismissed or carelessly misdiagnosed with mental health issues. It is well known in the medical world that there are 3 times in a woman’s life when she is most vulnerable to develop a thyroid condition or worsen an existing one, known as the 3 Ps: Puberty, Pregnancy/Postpartum, and Perimenopause. With over 700 million people with thyroid issues worldwide, and over half unaware of their condition, postpartum thyroiditis is more common than anyone can imagine, yet thyroid testing is not part of routine screening at a woman’s first prenatal visit when she is newly pregnant (and it should be!) nor at the first postnatal checkup around six weeks after giving birth (and it should be!) .